First, listen to this brief explanation on defining religion, then read the text that follows for a more detailed description. While there are many specific and different religions, religion itself is an abstract concept—a general category of human pursuit that manifests itself in a variety of ways in different cultures, times and places. It is easy enough to create a list of different religions by name but to lump them all together in a single group (religion) and then try to describe or define what that group is, can be a rather perplexing task. We need to think in terms of a category rather than in terms of “kinds of…” that fit into that category. Sometimes a student will side-step the task, stating that religion is so personal and unique to each individual that there cannot be just one definition. In fact, there have been countless definitions offered by many well respected scholars and philosophers. 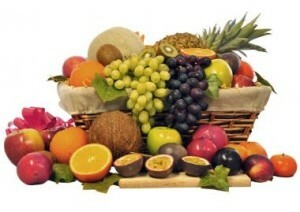 Just as it is certainly possible to define what fruit is, even though there are many kinds of fruit, so it is certainly possible to define what religion is as a general category. Yes, each person will experience religion in a different way. Even each Christian will experience the Christian religion in a different way. But that does not mean we cannot approach a somewhat universal definition of what being Christian means—the common ground, if you will. So, similarly, just because each person has a different experience with religion, does not mean we can’t begin to approach some sort of more universal understanding of what the nature of religion is as a general concept. Doing so may be a matter of seeing what sort of things most religions have in common, thus being able to arrive at a common foundation even while the specifics will differ from one experience of religion to another. Sometimes a student will argue that there are so many different religions that there is no way to propose a single definition or description of religion that will apply to them all. This suggests that each religion is a category unto itself. If this were the case, we would not even have the word “religion.” This observation is like suggesting that there are apples and oranges and bananas and peaches and pears and grapes but there is no way to explain what “fruit” is without explaining what each kind of fruit is. If you were asked to define what “fruit” is, you would not use a description of an apple or an orange to explain what counts as “fruit” because “fruit” comes in so many different varieties. “Fruit” is something bigger than any specific kind of fruit and religion is bigger than any particular kind of religion. We want to avoid a definition that is too narrow. But we also want to avoid a definition of religion that is too broad. If, in trying to define what “fruit” is we actually end up defining what “food” is, then we are giving a definition of fruit that also includes things that are not fruits. And we’d want to be able to distinguish between fruits and vegetables, thus offering a definition that is “sufficiently specific” to what we are trying to define. We also want a definition that is comprehensive of the multi-faceted nature of that which we are defining (be it fruit or religion). To focus merely on one essential characteristic is insufficient. Fruit is not merely “something with seeds inside it.” Religion is not merely a matter of “belief in an higher power” although this may certainly be among some of the most important aspects of religion. When defining something we also want to avoid value judgments. We would not define “fruit” by saying it is “something that tastes good.” Not only is this a value judgment that not everyone would agree with, it is rather vague and thus not very helpful. A good working definition of religion . . .
For example: If we say that religion means “belief in God” (having in mind God as Jews and Christians think about God), we will leave out those people who worship many deities (a general word meaning gods or goddesses) and those who worship none at all. This description also focuses on belief and excludes other important dimensions of religion (e.g. practices, rituals, moral values, etc). Descriptions that state what “true” or “genuine” religion is often fall into the trap of imposing one person’s or group’s bias on the description of religion generally. Avoid being a negative critique of religion. For example, Freud’s statement that “Religion is an infantile dependency, a neurosis” or Karl Marx’s statement that “religion is the opium of the people and the sigh of the oppressed” do not describe what religion is so much as explain it as a psychological or sociological phenomena (reductionism). These definitions also discredit religion, casting it in a negative light.Avoid offering a theory of religion (e.g. explaining the origin or purpose of religion, such as Freud and Marx do) rather than describing it objectively. Substance and function is like “form and function”—the “what” and the “why” (purpose) of a thing. Form is what something looks like or how it is shaped. Function is what it does, why it exists. A chair is something with a seat that stands about 18 inches off the ground, generally on four legs, and having a back (that is the substance, form or shape of a chair). 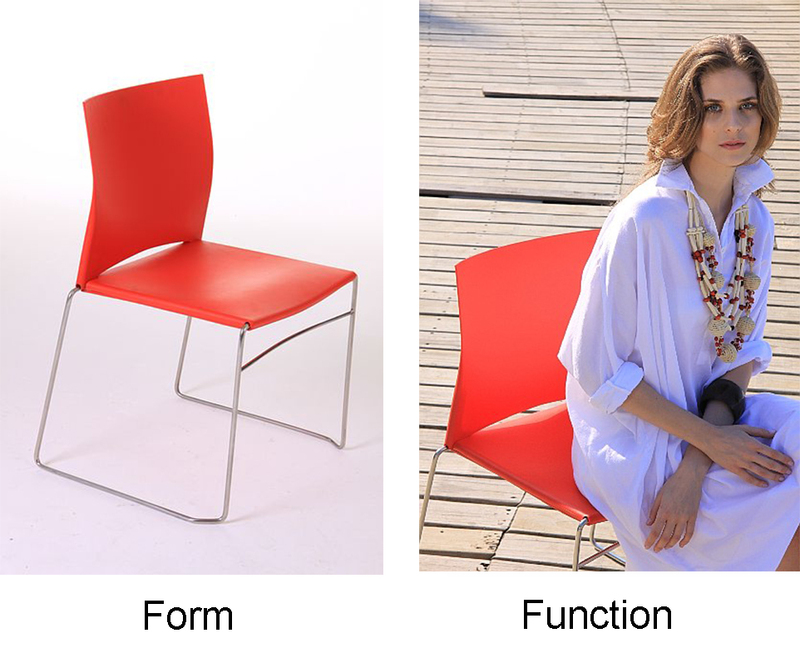 The purpose (function) of a chair is “something to sit on.” Presumably, the chair has the form it does because that form is effective in serving its function. Substantivist (or “essentialist“) definitions tend to be overly specific, narrow or limited as it is most difficult to find a single characteristic that is common in all religions. However, functionalist definitions tend to have the opposite problem—being overly broad, providing a function of religion that is also shared with things that are not religions. The function of a chair is also served by a stool and a couch but stools and couches are not chairs. The solution to this problem is, perhaps, to assure that we address both substance and function in our definitions. Substance and function together tell us what and why a chair (or a religion) is what it is. In addition, if we address several aspects of religion, several elements of its substance, we can allow for necessary flexibility. 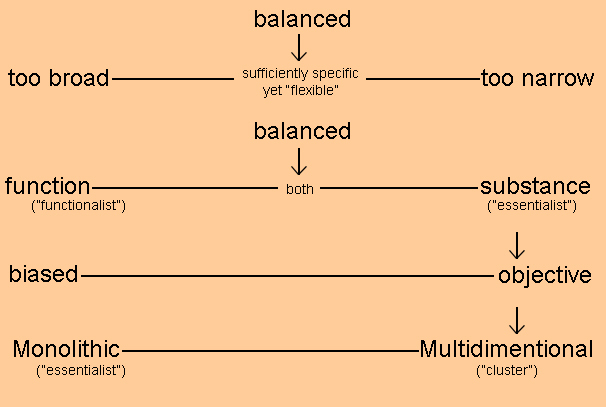 This a “cluster” or “multi-dimensional” definition. We can begin by considering what most, if not all religions have in common that distinguish them from things that are not religion. We seek to brainstorm the common features and characteristics of any religion even while realizing that any given religion may or may not have all these characteristics. In such case, those things that share a majority of the characteristics are more likely to be religions while those things that share fewer characteristics may be less likely to be religions. This is an approach to defining religion sometimes called a “cluster” definition or identifying “family traits” (the family being that of “religion”). We can consider characteristics related to the substance of religion: beliefs, values, practices. We can also consider characteristics related to the function of religion (the unique role religion plays in our lives as distinguished from the functions of other things in our lives). So: of what does religion consist (its substance) and why does it exist (what is its unique function or purpose in our lives)? The challenge of developing a good definition is to be short and sweet. Limit it to a sentence or two – a simple but comprehensive statement rather than a lengthy paragraph. Religion is a set of beliefs and practices which serve to subordinate us to something superior or holy in order to justify the events that control our lives. This definition merely describes religion, identifying the substance of religion (“set of beliefs and practices”) as well as its function (“subordinating us to something superior or holy, justifying events that control our lives”). This definition is “sufficiently specific” by its reference to “something superior or holy” and yet broad enough to apply to many different kinds of religions (the “something superior or holy” may be one or more gods or even a sense of the sacred that does not involve any personal deities at all). In referencing both “beliefs and practices” it is sufficiently comprehensive without being overly wordy. This definition, being merely descriptive, does not hint at any value judgment, neither positive nor negative in nature. Select a definition of religion (or propose one of your own) and analyze it as demonstrated above: what makes it a good or poor definition? How might it be improved?